Saturday was one of those strange days where the weather forecast changed, leaving me not particularly inspired where to go take the camera. But I carried on regardless up to Kinloch Rannoch and climbed Craig Varr. 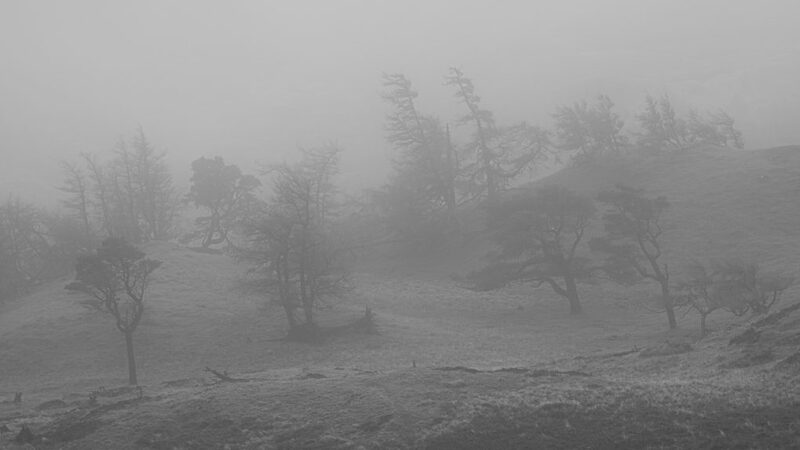 The views on the way up were pleasant: nice trees silhouetted against the sky, views along Loch Rannoch; as I reached the top of the crag, however, the mist came down reducing visibility to barely 100yd with low cloud flowing over the trees in front. Descending, below the cloud level, I could see clouds zipping along above Loch Rannoch like a steam-train, the mountains opposite appearing and receding in the mist. 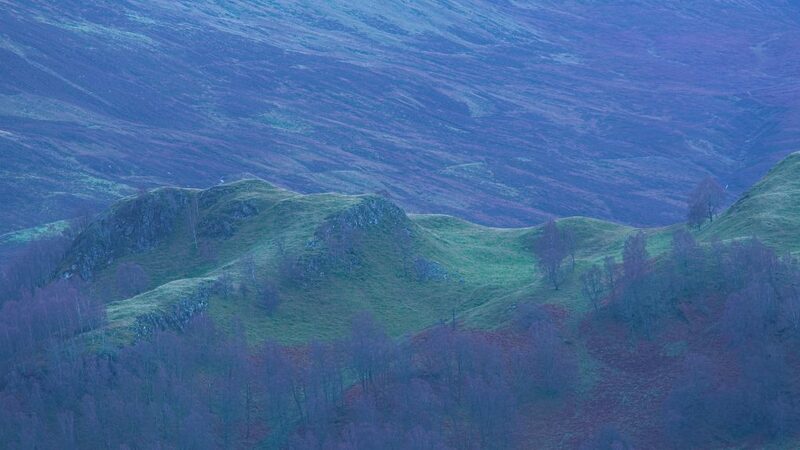 Sparse trees on Creag an Fhithirich, better known as the Sleeping Giant: a beautiful lumpy shapely crag in the foreground before Meall Dearg across the valley from Craig Varr. 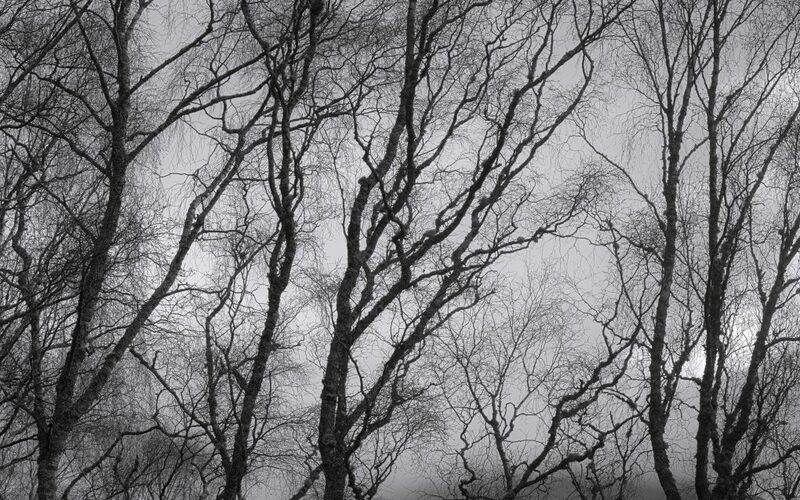 Simple things: abstract shapes of tree branches and twigs forming a fine filigree silhouetted against the sky beyond. 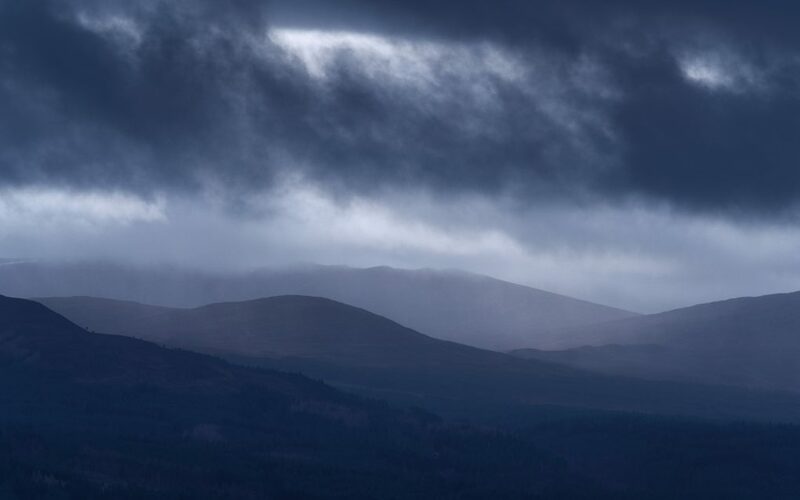 Some of my favourite landscape elements: a contrasty plasma-cloud sky and overlaping layers of mountains receding into the distance, the other side of the Black Woods of Rannoch. 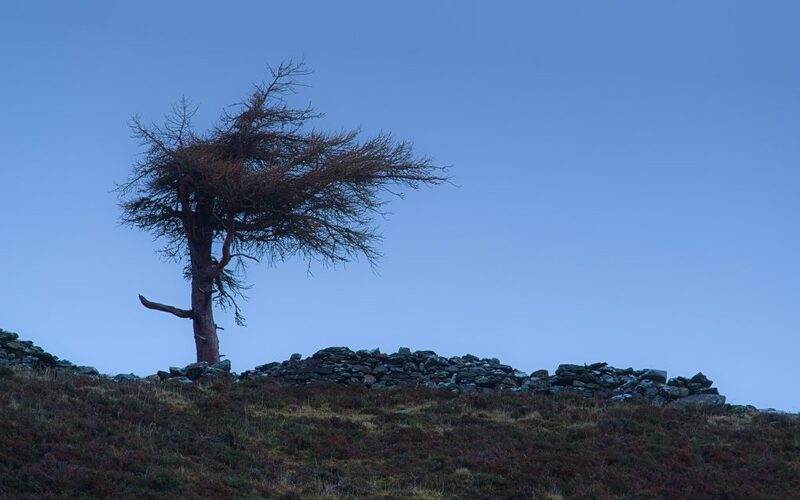 Shape and solitude: a much-windswept lone tree battling the elements at the top of Craig Varr. On previous visits to the location I’ve tried to replicate another photographer’s work, getting the Sleeping Giant a mile away across the river in the corner of the photo; this time, however, thick mist at the top of the crag put paid to that idea, completely eliminating anything in the distance with a visibility of about 50yd. 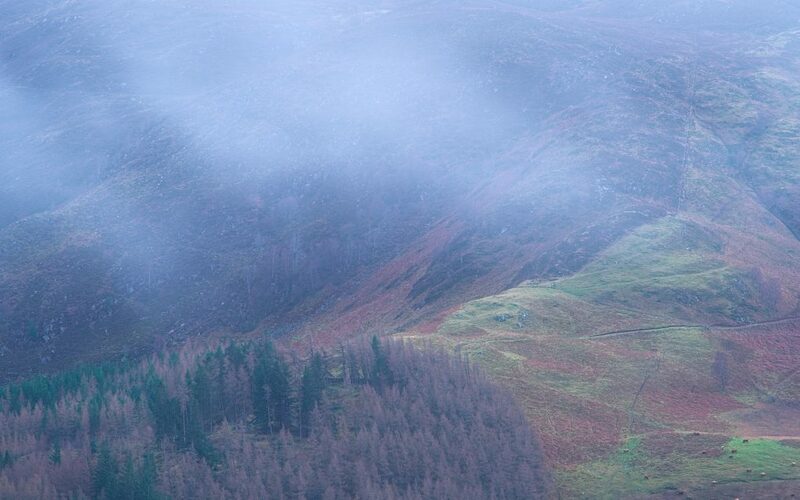 An energetic climb up Craig Varr outside Kinloch Rannoch as the mist flowed over the mountains, followed by a quick descent to return to civilisation. This was taken from the way back down, as I paused to admire the clouds flowing fast along Loch Rannoch like steam trains. 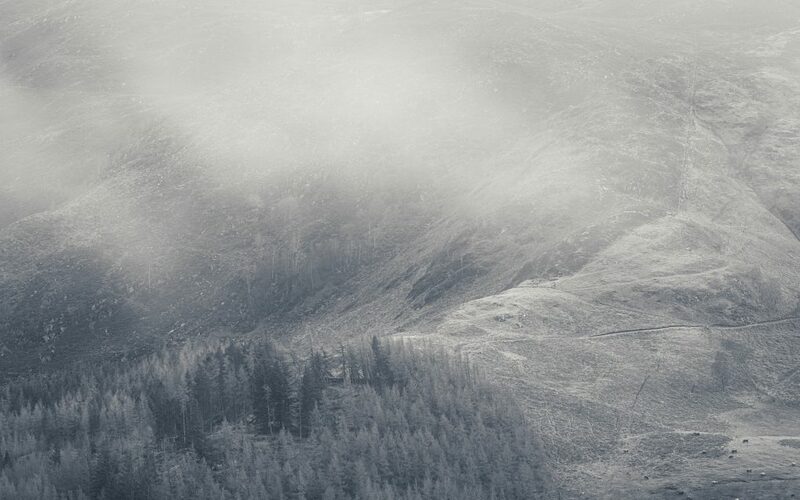 This entry was posted in art, Highlands, Landscape, nature, Perthshire, photos, Rannoch, Scotland and tagged autumn, bleak, cloud, Fuji X-T20, landscape, mist, nature, Perthshire, Scotland, weather, wild.